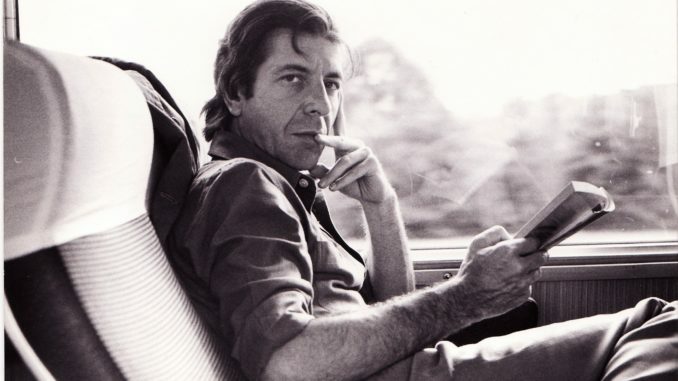 NEW YORK, April 12, 2019 /CNW Telbec/ – Today marks the official launch date for the Leonard Cohen:A Crack in Everything exhibition’s international tour, as it makes its first stop at the Jewish Museum in New York City. Following its phenomenal success at the Musée d’art contemporain de Montréal (MAC), where it premiered in 2017 and attracted over 315,000 visitors, the exhibition will be presented at the Jewish Museum from April 12 to September 8, 2019. “I couldn’t think of a better city than New York to begin this tour,” said John Zeppetelli, Director and Chief Curator of the MAC, earlier this week at the exhibition’s press preview in New York. “It’s an extraordinary time for the Museum and a fantastic opportunity to revisit, in a different context, this exhibition, which reached such a wide audience in Montreal,” he added. A truly multidisciplinary exhibition combining visual art, installations, music and writing, Leonard Cohen: A Crack in Everything offers the public a collection of new works created by a remarkable group of local and international artists who have been inspired by Leonard Cohen’s life, work and legacy. The audience is invited to experience an in-depth, immersive, participatory and visually captivating journey. The exhibition will be presented slightly differently in New York than it was in Montreal: the MAC collaborated with the Jewish Museum to create a unique presentation adapted to the latter museum’s spaces and layouts, while respecting the exhibition’s concept, spirit and nature. While Cohen fans and contemporary art and music aficionados from New York and abroad will discover the exhibition for the first time, visitors who had already seen it in Montreal can revisit it and enjoy its new configuration in a completely different space. The Jewish Museum’s presentation includes the works of artists Kara Blake, Candice Breitz, Janet Cardiff and George Bures Miller, Christophe Chassol, Daily tous les jours, Tacita Dean, Kota Ezawa, George Fok, Ari Folman, Jon Rafman and Taryn Simon. Leonard Cohen’s self-portraits are also presented as part of the exhibition, as well as the audio installation Listening to Leonard, where visitors can listen to cover versions of Cohen’s songs performed by guest artists, including Feist, Lou Doillon, Moby, and The National with Sufjan Stevens, Richard Reed Parry and Ragnar Kjartansson. After New York, the tour will continue on to Copenhagen, at the Kunstforeningen GL STRAND and Nikolaj Kunsthal from October 23, 2019 to March 8, 2020; followed by San Francisco, at the Contemporary Jewish Museum, from September 17, 2020 to January 3, 2021. Plans are underway to extend this first phase of the tour and add other destinations. Organized entirely by the MAC for Montreal’s 375th anniversary A Crack in Everything received the approval of Leonard Cohen himself and was launched a year after his passing in 2017. The exhibition, which ran five months, was accompanied by a series of five concerts. A major catalogue—the 400th published by the MAC since the creation of the Museum in 1964—details this unique exhibition by tracing the two years of preparation preceding its opening. It includes texts by curators John Zeppetelli and Victor Shiffman, artists, Leonard Cohen’s biographer Sylvie Simons and author Chantal Ringuet. With this tour, the MAC joins forces with renowned museums in cultural capitals around the world, and strengthens its presence on the international art scene as many of its exhibitions are currently touring. The Museum also achieves its objectives of presenting and promoting Québec, Canadian and international artists, as well as promoting Montréal, Leonard Cohen’s hometown. The MAC is a state corporation funded by the Gouvernement du Québec. It receives additional funding from the Government of Canada and the Canada Council for the Arts. The MAC wishes to thank Leonard Cohen for his support of the exhibition. Robert Kory, Adam Cohen, and Lorca Cohen, provided invaluable assistance in the successful organization of this project. The MAC also thanks CBC/Radio-Canada and the National Film Board of Canada (NFB), as well as Sony Music and Sony ATV. For the exhibition’s presentation in New York, the MAC is also grateful for the additional support of the ministère de la Culture et des Communications du Québec, the Canada Council for the Arts/Conseil des arts du Canada, and The Azrieli Foundation/La Fondation Azrieli. During the run of the Leonard Cohen exhibition, Jewish Museum hours will be: Saturday and Sunday, 10am to 5:45pm; Monday and Tuesday, 11am to 5:45pm; Thursday, 11am to 8pm; Friday, 11am to 4pm. $18.00 for adults, $12.00 for senior citizens, $8.00 for students, free for visitors 18 and under and Jewish Museum members. Pay What You Wish on Thursdays from 5pm to 8pm. Free on Saturdays and select Jewish holidays.